An aerial photograph of the land east of Avenue J. 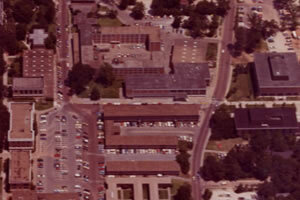 The original section of the LSC, shown in the mid-1970s, was expanded in 1981. The LSC pool was a popular attraction at one point, but had seen little use by the late-1990s. Its removal was one of the highlights of the renovations of 2000. The Lowman Student Center (LSC) is located in the heart of campus and contains dining areas, meeting rooms, a theater, an art gallery, ballroom, a bookstore and many other facilities for students, staff, faculty, alumni and guests. Austin Hall was used as a student social center around 1919. 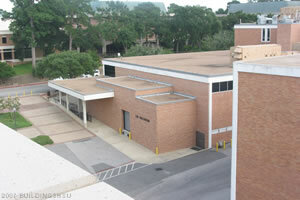 The first separate student union building was erected in 1950; it is known today as the Houston Building. The LSC was home for many years to the university's only indoor pool, installed in the northern end of the building on April 1, 1964. 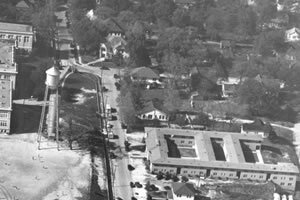 It was a popular destination for many years but continuous equipment breakdowns and lack of exposure and subsequent disuse closed the pool on December 31, 1997. As part of the $11 million renovations in the early 2000s, the former pool area was converted into a larger ballroom. Other changes include new meeting rooms, an information center, expanded dining venues, and two-story atrium. The building's technological upgrades include Internet access and teleconferencing capabilities for conference rooms and the latest virtual reality games for the expanded game room. 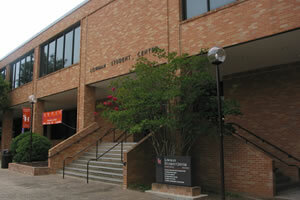 The LSC Mall is defined as the area between the Avenue I and Alumni Fountain and between the LSC and the edge of Bearkat Plaza. 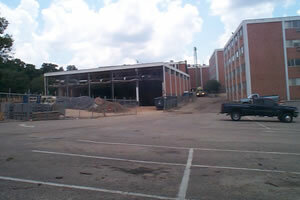 It was announced in 2009 that the LSC was on the demolition schedule as part of the 2008 Campus Master Plan. SHSU President James Gaertner, speaking in July, said the building "has gotten to the point where it's getting outdated and needs to come down. We won't tear it down until three or four years from now. We will build a new student center right there in the same place in the middle of the campus ."